Peacock Feather allover stencil pattern. Easy DIY wall decor for a great price! Top part stencil and a Single stencil are included for FREE! Our Peacock Feather allover stencil pattern will add dramatic flair to any interior. Feather stencils are very popular in today's decor! Use this wall stencil to create an accent or feature wall, or even stencil this beautiful pattern around the entire room. Anybody can achieve fantastic results without the hassle or cost of wallpaper! 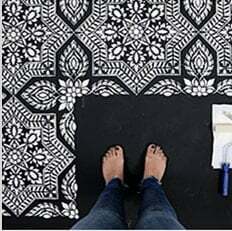 DIY decorators can also use this stencil for rugs and floors, or to create one-of-a-kind designer curtains. Try stenciling this design in metallic paints to achieve the shimmer of the real peacock feathers! This wall stencil comes with a Free top edge stencil for filling in the areas at the ceiling edge. For the aligning instructions, please refer to the step-by-step photos above! It's very important to stencil the small registration marks (that are part of the feather) for proper alignment of the stencil. We also included a FREE single stencil, just to help you to get into the tighter places around moldings, light switches, tight corners etc. This designer stencil is made out of durable 12 mil clear plastic stencil material. This material is strong but flexible, reusable and easy to clean. We love it so much more than standard 5-8 mil Mylar! It's not brittle, user friendly and just so easy to work with. In our many years of professional stenciling this material has proven to be far superior than any other stencil material we used. Our customers love it too, and we are sure that you'll notice the difference! Our stencils will last a long time and are a pleasure to use.